The Recording King guitar was developed during the golden age of musical craftsmanship. The retro design and the great attention to detail makes it stand out from the rest. Oh my – the Recording King just breathes history - starting out as a house brand for the American department store Montgomery Ward in the 1930’s, Recording King was developed during the golden age of musical craftsmanship. Their retro designs are what separates Recording King from other brands and their tasteful use of vintage appointments and attention to detail makes a Recording King a guitar that you can pass down from generation to generation. Modelled on the mail order guitars of yesteryear, the "Dirty Thirties" 000 shaped guitar boasts a solid spruce top in a matte sunburst finish. Comes with bone nut and bridge saddle and period correct vintage white tuners. 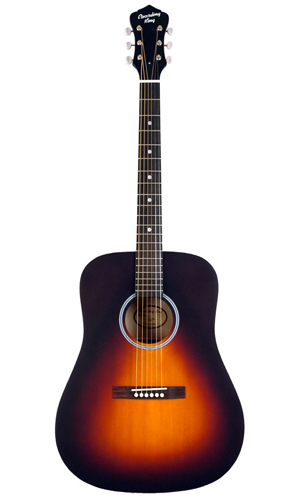 Modelled on the mail order guitars of yesteryear, the "Dirty Thirties" dreadnought shaped guitar boasts a solid spruce top in a matte sunburst finish. Comes with bone nut and bridge saddle and period correct vintage white tuners.